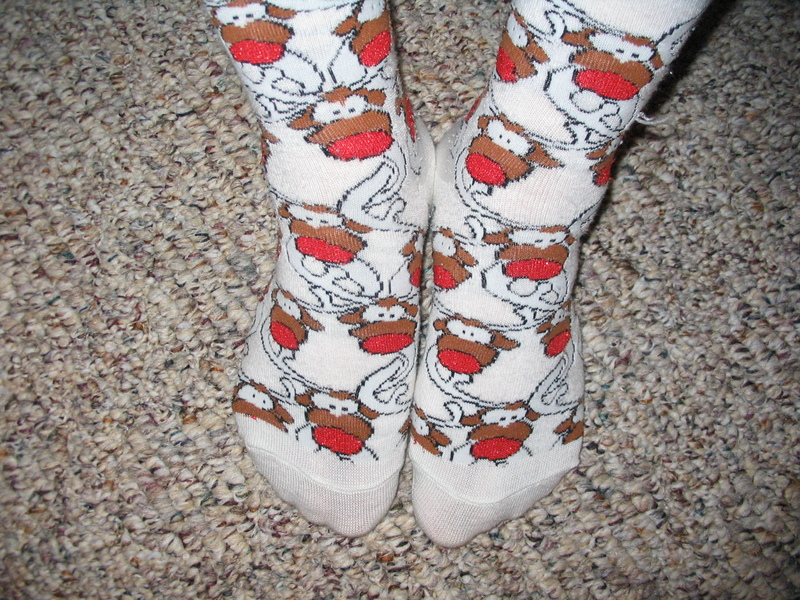 Presenting drunken Rudolphs, the socks that started my Christmas sock obsession. Unfortunately, Rudolph is going to that sock drawer in the sky because one of the drunken Rudolphs is missing his big red nose, thanks to a pull. 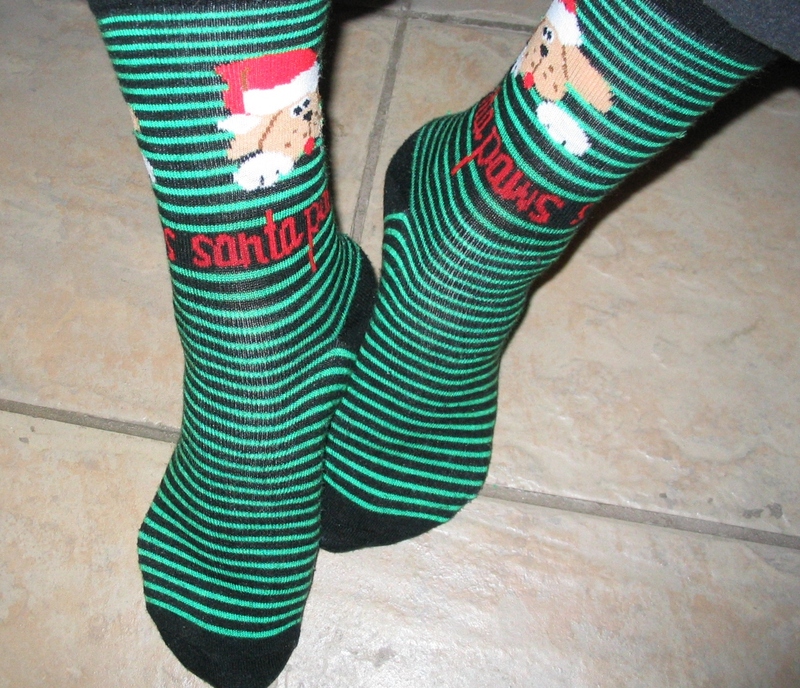 I wore them to do last minute stuff at home. I added more ornaments to the tree, picked up around the house, strung my dad in the window. It wasn’t really my dad. It was a lighted Hallmark memorial ornament, only it didn’t want to light this year. After replacing a dead bulb with the only one that fit in the socket, my father now blinks at me from the kitchen window. It tickles me to see his smiling face blinking on and off, keeping me company. Family. Have you ever thought about whether Mary and Joseph had anyone with them during the start of their family? A midwife, maybe? One of Joseph’s relatives? That part of the story is missing. Where was their family? We’ll be missing our extended family this year. We live too far away, but they are in our hearts. Like my dad. He’s in my heart now and forever, although he’s never blinked at me before. Today was a work day today. 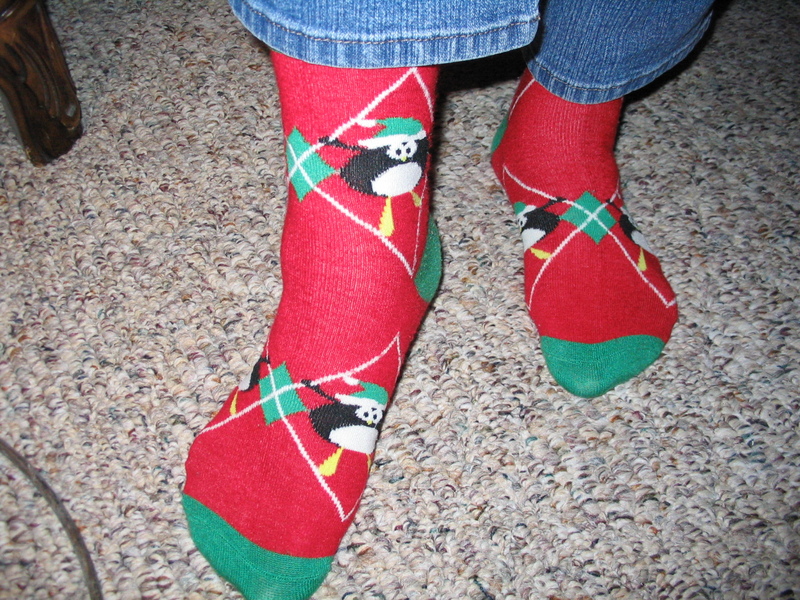 My gaudy Santa Paws socks livened my spirits. I’m decorating the house in hopes of getting the tree up tonight. I love the way my house looks at Christmas time. My normal plain décor gets a facelift in reds, gold and greens. 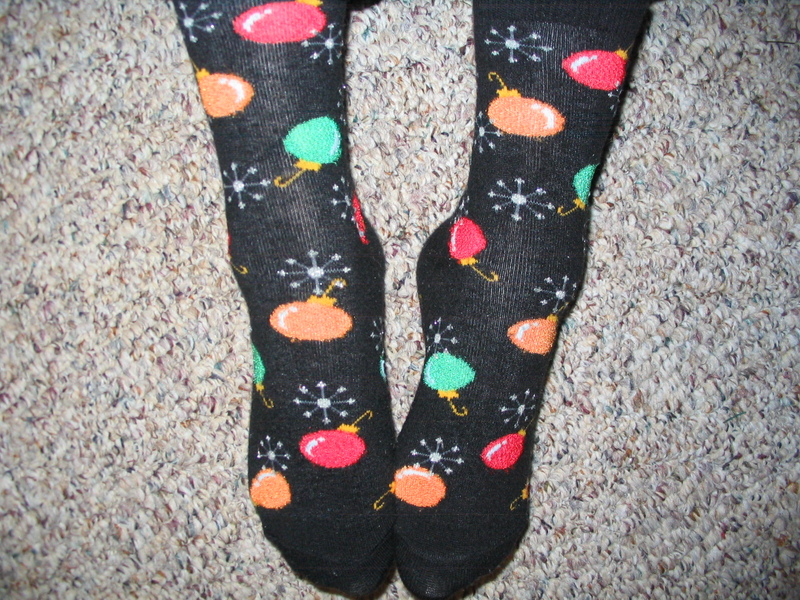 Like my socks, it makes me happy. My usual target date for taking down my decorations is January 7th or after. When I was in school many years ago, I was envious of my Orthodox friends who got to stay home from school on January 7th for Russian Christmas. It was like having two Christmases to my young mind, complete with more presents. Why couldn’t Protestants have a second Christmas too? No fair. After I got married, I got my wish, as we traveled between families at Christmas. One year, when we lived 500 miles away from family, we had three, and I loved it. Nowadays, at 650 miles away, we’re content to stay at home. One Christmas is fine. Plus, I get to enjoy my pretty decorations for a little bit longer.